The episode entitled "Basketball" (Season 1, episode 5) was the first episode of The Office that I ever saw. Not a bad introduction to a series, eh? It remains one of my three favorite episodes of The Office, the others being "Christmas Party" and "The Convict" for anyone wondering. No need to wax poetic about how genius the show is so I'll get right into the cards. The Office of course is a newer show and the episode for which these two cards are based on first aired in 2005, not all that vintage. That being the case it was a matter of using what I would deem to be the funnest basketball template to put the cards into. I briefly considered creating a design inspired by the 1990-91 Fleer basketball cards. I've not used that base card but I did use the Rookie Sensations insert set for this card. 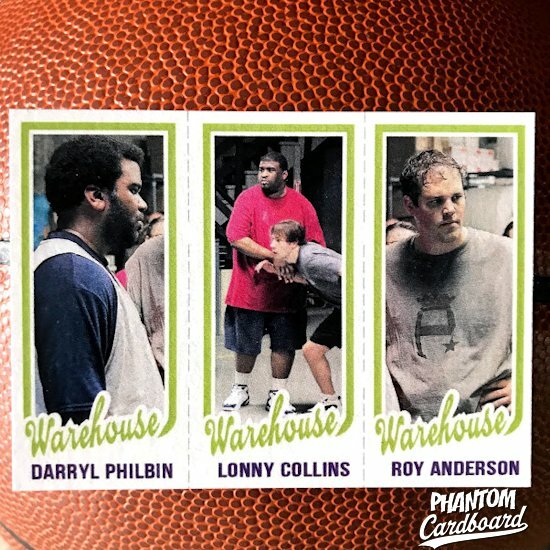 But, I was thinking I wanted to do a team card for Sales and Warehouse instead of individual cards which brought me to the iconic 1980-81 Topps basketball inspired design. I had a feeling that they would be pretty sweet done in that style. 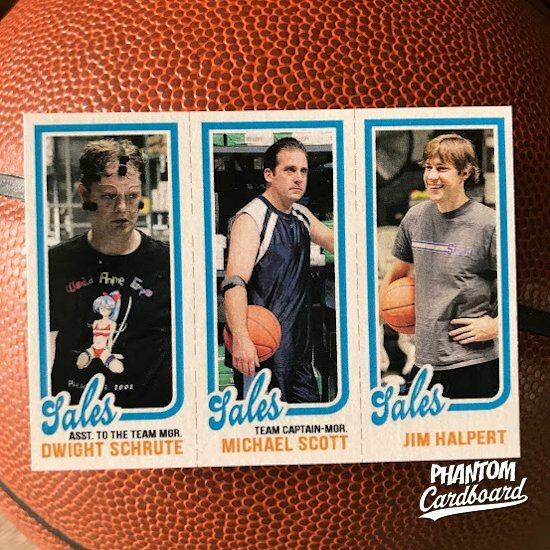 Since it was a pick-up game I wasn't to concerned with positions but I did have a little fun with the Michael and Dwight card. If you're not familiar with the episode Dwight asks Michael if he can team captain and Michael shoots him down saying that he's the team captain. Dwight them tries for Michael's permission to be team manager, Michael shoots him down again claiming the manager role as well. So, Dwight tries again, this time for assistant team manager and Michael finally acquiesces to assistant "to the" team manager in keeping with the show's running Assistant to the Regional Manager joke. Questions? Comments? Just lonely? e-mail me here. Phantom Cardboard 2016-2018. Awesome Inc. theme. Powered by Blogger.